Karella was drawn to Tsarouchis’ charismatic fire, and he at once proposed that she study with him. As she describes this formative experience, it is one in which life and art were inextricably intertwined, as were intellectual pursuit and romantic passion: “After school, I used to go and hang around his studio. He had a face like Socrates, and he had these sayings. He would never sit at a desk to speak to you. You would just be in his studio, and the most amazing Brazilian artists would come and dance, and then he’d play Greek folkloric music.” There were no exercises and no entourage, just Tsarouchis, Karella, and one or two other students. “It was very much one on one with him,” she remembers. “He gave me things he needed to have done. I was like an assistant, an apprentice. Sometimes I had to cook his rice and sweet peas! But he was very wise — he had an amazing knowledge of Greek tragedy, of opera. He transmitted his values, but like that — they were in the air.” Karella’s first taste of big-time theater was the production of Norma at Epidaurus in 1958, featuring Maria Callas. Tsarouchis was doing the sets and costumes, and Karella got to observe first hand and assist on the production. Karella’s next collaboration with a professional artist was also in the theater. After finishing school, she was attending art school in Athens, when the famous actor Taki Horn, a friend of her parents’, wandered into her room and saw her work on the wall. “Show me what you’re doing,” he said. She showed him, and he said, “Okay. I commission you to do the costumes for my next play.” She was only 19 and told him, “Taki, you must be out of your mind. I’m just Tsarouchis’ pupil, and I go to art school. I don’t think I could do it.” Horn replied, “Look. In life, either you take the chances, or you let them go by.” So she took him up on his offer. The first decor she did for Horn was influenced by Tsarouchis, but it pleased Horn, and he asked her to work with him again. The third time, it was to do the sets and costumes for Gogol’s Diary of a Madman, and this time the design was integral to the play’s success. 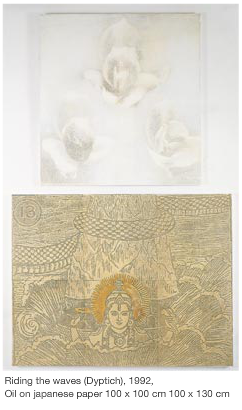 Karella evoked the world inside the madman’s head by pasting many pieces of cigarette paper on a huge silver backdrop. She was 20, and from that time on, she was a professional designer, doing major productions in Greece, Italy, Switzerland, and elsewhere. Even later, when she made the decision to concentrate on her work as a visual artist, offers would arise for productions, and she would take some of them. By the time she was 24, she had done sets and costumes for plays by Aristophanes, Euripides, Molière, and Cocteau, and had designed a production of Shakespeare’s A Midsummer Night’s Dream for the National Theater of Greece. In the early 1960s, Marina advanced her knowledge of visual art techniques through studies with Oskar Kokoschka at his summer school in Salzburg and studies at the Beaux Arts in Paris from 1962 to 1964. The key meeting in her life, though, one that would ultimately change its course, leading her away from Greece, which, despite its attractions, placed certain limitations on anyone wishing to be a contemporary artist, and drawing her towards Paris and New York, was her meeting with and marriage to Prince Michael of Greece. Michael is an historian, who has written books on portraiture and ghosts, among many other topics, and through him, Karella was soon introduced to a world of varied cultural influences. They married in 1965 and moved to Paris in 1975. In the intervening decade, much changed for Marina. She met the dealer Alexander Iolas, a flamboyant figure who had once been a dancer with the Diaghilev ballet and who later had been instrumental in helping build the de Menil collection of works by Max Ernst and other artists. In the 1960s, Iolas had galleries in Paris and New York, where he showed Jean Tinguley, Niki de St. Phalle, Paul Thek, Pino Pascali, Harold Stevenson, and others. Karella credits the dealer for encouraging her to take her work more seriously, to be critical, embracing aspects of it while rejecting others. It was Iolas who introduced Niki de St. Phalle to Marina. This friendship would have major repercussions for Karella, both on the personal and professional planes. Some of Karella’s earliest paintings used friends, many of them artists, as subjects. There is the sense in these works that she is depicting beauty itself. 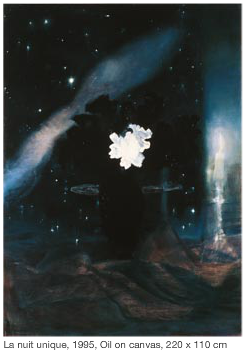 The presentation of the figure and graphic impact in a work like Sophia’s Shadow, 1972, are reminiscent of fashion photography. Karella’s own photographs have been published in magazines about style, including Issue, at the request of photographer Jack Pierson. The ways beauty and glamour are portrayed in the fashion world are never far below the surfaces of Karella’s portraits. I wonder what Marina has to say about “beautiful people” in her work. “That’s where I imagine I’m influenced very much by the Greek tradition,” she begins. “The depiction of beauty in sculptures in classical Greece has definitely affected me all through my life. Somehow though, a beautiful interior makes someone beautiful. The people are real but idealized. I chose people that suited me, but then most young people are beautiful.” While many of Karella’s earliest paintings were portraits, they were generalized. In a fashion that would become typical for her, they are simultaneously portraits and not portraits, just as when she paints interiors, they are interiors with other elements included.